Diving is one of those adventure sports that leaves a deep (get it?) impression on you every time you hit the water. Whether it’s scubadiving in a coral reef, diving to a shipwreck or just embracing marine wildlife like manatees or mantas. You can have a total different look at the world through your dive mask. Here are five of the best locations to have the ultimate diving experience. Divers willing to make the long journey to this coastline will be rewarded with some of world’s best underwater views. This island is said to have inspired the Jurassic Park filmmakers but nonetheless you will not find any dinosaurs here anymore. However the wildlife might be as good. The surrounding waters are populated with scalloped hamerheads and white-tip reef sharks easily spotted by experienced divers. This island is located in a national park where tourists are not allowed to lodge on. Maybe not as famous as the Great Barrief reef in Australia but this second largest reef in the world offers astonishing diving. This series of coral reefs is straddled alongside the coast of Belize and hosts an outstanding natural system. Offshore atolls, mangrove forests and hundreds of sand cays are the territory for threatened species as marine turtles and manatees. Oh, and did we tell you ist far less crowded with tourists? Divers seeking an unique experience will find this in Iceland. 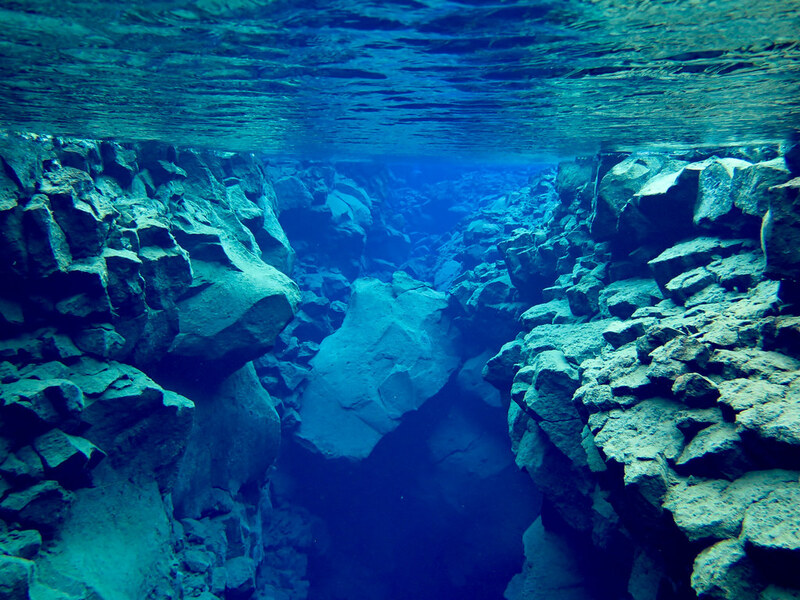 The Silfra fissure is one of the top locations to dive for two reasons. For one, this fissure is actually a crack between two continental plates: the North American and Eurasian continent. So you can dive right where these plates meet. Even better. Silfra is the only place where you can dive directly into the crack. Secondly, the visability under water is over 100 meters, creating an experience that will hardly be surpassed. Wreckdives are hugely popular amongst divers. And for good reason. Swimming around and inside a rusty wreck with nothing but flashlights to peer at this piece of history is a great experience. The British transport ship SS Thistlegorm which was attacked and sunk in 1941 is the most popular wreck dive in the world. The wreck is located at the Red Sea in Egypt where you can still explore its cargo containing rifles, motorbikes and trucks. Mexico has a lot of diving locations that are well worth booking your next trip to this Central American country. In the Yucatan Peninsula you can have a truly unique experience by diving in a huge limestone platform where fresh water runs like rivers through underground cave systems. These underwater sinkholes are called cenotes, derived for the Mayan word for ‘sacred’. These cenotes where considered to be the entrance to the mythical underworld. Only for experienced divers! Which places should be added to the list? Leave your suggestions in the comments.